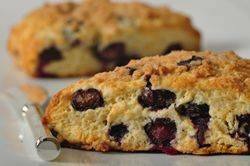 Blueberry Streusel Scones: Preheat oven to 400 degrees F (200 degrees C) and place oven rack in the center of the oven. Line a baking sheet with parchment paper, or lightly butter or spray the baking sheet with a non stick vegetable spray. In a large bowl, whisk together the flour, sugar, baking powder and salt. Cut the cold butter into small pieces and blend into the flour mixture with a pastry blender, your fingertips, or two knives. The mixture should look like coarse crumbs. Gently fold in the blueberries. In a separate bowl whisk the beaten egg with the vanilla and milk. Add this mixture to the flour mixture and stir just until the dough comes together. Do not over mix the dough or the scones will be tough. Transfer the dough to a lightly floured surface and gently knead the dough four or five times and then pat the dough into a 7 inch (18 cm) round. Cut this circle in half, then cut each half into four pie-shaped wedges (triangles). Place the scones on the baking sheet. Brush the tops of the scones with a little cream or milk. Streusel Topping: In a bowl whisk together the sugar, flour, and cinnamon. With a pastry blender or two knives, cut in the butter until the mixture is crumbly. Top each scone with a teaspoon or two of the streusel mixture. Cover and refrigerate any leftover streusel mixture. Bake the scones until nicely browned, about 18 - 22 minutes or until a toothpick inserted in the center of a scone comes out clean. Transfer to a wire rack to cool slightly. These are best eaten the day they are made but can be covered and stored for a few days. The scones can also be frozen.